Electrical engineers in the accelerator physics group at TU Darmstadt have developed a design for a laser-driven electron accelerator so small it could be produced on a silicon chip. It would be inexpensive and with multiple applications. The design, which has been published in Physical Review Letters, is now being realised as part of an international collaboration. Particle accelerators are usually large and costly, but that will soon change if researchers have their way. The Accelerator on a Chip International Program (AChIP), funded by the Gordon and Betty Moore Foundation in the U.S., aims to create an electron accelerator on a silicon chip. The fundamental idea is to replace accelerator parts made of metal with glass or silicon, and to use a laser instead of a microwave generator as an energy source. Due to glass's higher electric field load capacity, the acceleration rate can be increased and thus the same amount of energy can be transmitted to the particles within a shorter space, making the accelerator shorter by a factor of approximately 10 than traditional accelerators delivering the same energy. As part of TU Darmstadt's Matter and Radiation Science profile area, the AChIP group in accelerator physics (Electrical Engineering and Information Technology Faculty at TU Darmstadt), led by the junior scientist Dr. Uwe Niedermayer, recently proposed a decisive solution which calls for using the laser fields themselves to focus the electrons in a channel only 420 nanometres wide. The concept is based on abrupt changes to the phase of the electrons relative to the laser, resulting in alternating focusing and de-focusing in the two directions in the plane of the chip surface. This creates stability in both directions. The concept can be compared to a ball on a saddle – the ball will fall down, regardless of the direction in which the saddle tilts. However, turning the saddle continuously means the ball will remain stable on the saddle. The electrons in the channel on the chip do the same. Niedermayer is currently a visiting scientist at Stanford University; the American university is leading the AChIP programme along with University of Erlangen in Germany. At Stanford, he is collaborating with other AChIP scientists with the aim of creating an accelerator on a chip in an experimental chamber the size of a shoebox. A commercially available system, adapted by means of complicated non-linear optics, is used as a laser source. The aim of the AChIP programme, which has funding until 2020, is to produce electrons with one mega-electron volt of energy from the chip. This is approximately equal to the electrical voltage of one million batteries. 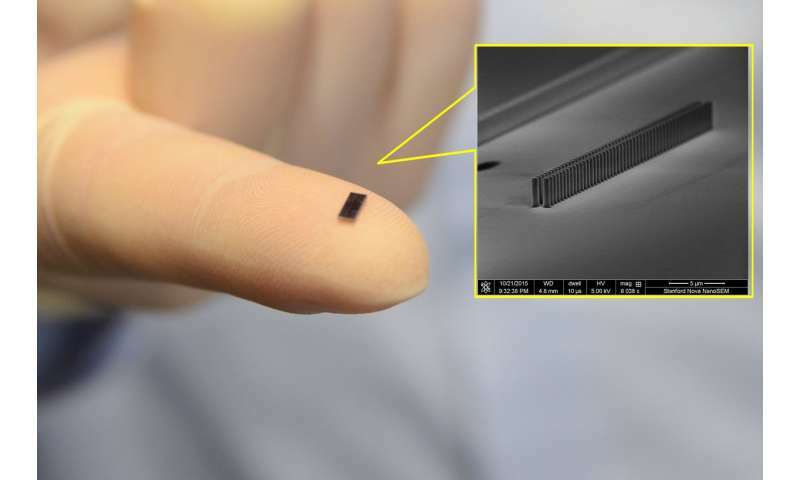 An additional aim is to create ultra-short (<10-15 seconds) electron pulses, as required by the design for a scalable accelerator on a chip developed in Darmstadt.